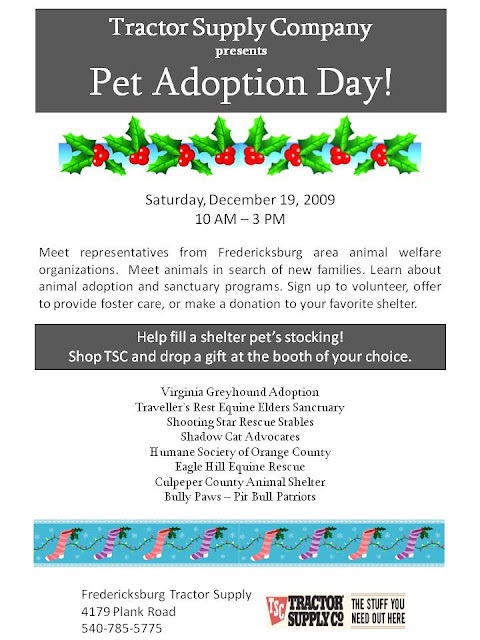 Adoption Day event cancelled due to impending snow storm. Thank you, TSC, for your support this year. We hope you continue these events in 2010. If so, see everybody next year! Meanwhile, thank you Gene, Carol and Jeanelle for helping with storm prep. Stalls and sheds are cleaned and bedded, water tanks full, hoses drained, paddocks picked, sufficient feed and hay on site........I think we're as ready as we can be. As long as Mother Nature keeps her sense of humor under control a little. 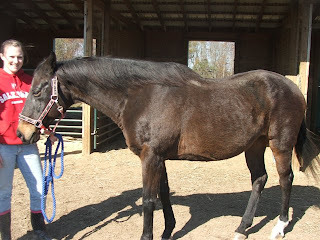 This gentle ol' soul has a way to go in the weight department, but is headed in the right direction. This is not "fresh" news, but this December 3 editorial blurb from the Culpeper Star-Exponent kind of sums up our feelings. When the story first broke, and Miss Mona arrived at TREES, we were angry. How could anyone allow this to happen to animals under his or her care? Then, as information became available and emotional first reactions calmed, we became more sad than angry about what had happened. We hoped to gain more understanding at the trial, but that was not to be. Now we are left with questions that will never be answered. If Ms Mackall "had stepped back from her role as the farm’s operator in recent years," who was supposed to be managing the herd? Was anyone monitoring the situation, knowing she was apparently gravely ill? Were family members aware of deteriorating conditions at the farm? Was Ms Mackall herself aware? Was there any "plan of succession" in case the primary caregiver became incapacitated? Do YOU have a "plan of succession" regarding your animals' care in case of sudden illness, injury or death? No? Consider putting one in writing as a New Year's Resolution. Don't let this happen to your four-legged family members. We've seen it often enough here. Discharge out of one nostril. Treatment with antibiotics helps, but the infection returns in a week or two. Hello, Dentist? According to the abstract of this paper on Sinus Surgery in the Horse, "the most common cause of sinus infection is extension of infection from a diseased tooth or as an aftermath to tooth repulsion." Long story very short........if your horse has a persistent or recurring nasal discharge, think "teeth." To see just how little barrier there is between tooth root and sinus, visit http://www.hanne.com/teeth-photos.htm and click on the fourth photo from the top. Its easy to see how an infection in a tooth root can move into the sinus right next to it. I cannot say enough about volunteers who come early on mornings like this one. "Thank you" just doesn't feel adequate. Thank you so much, Jeanelle, for coming out and for drying out Sherman and Henry's stalls as much as possible when everything is so completely saturated. Jeanelle didn't quite fill Big Sam, the old JD spreader, but she came darn close and, considering the weight of the wet sawdust, we're counting it as a Golden Muck Fork Award winning day. Some of these compounds are marketed for other uses, such as anti-inflammatories, anthelmintics, muscle builders, and coat conditioners. Scientific evidence demonstrating any beneficial effect of these herbs on insulin resistance in horses is lacking. Noble and her coauthors emphasized, "The aim (of this review) is not to advise clinicians or horse owners about what to use, but to inform equine scientists contemplating research in this field." These snow/ice balls are everywhere this morning! You can see how this might make walking difficult, if not downright dangerous, if not removed. In our experience, healthy bare feet, able to flex and function naturally, usually pop the snowballs out as the horse moves about, with no human intervention. 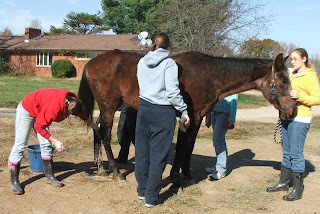 In some cases, however, we do need to assist with a hoof pick. 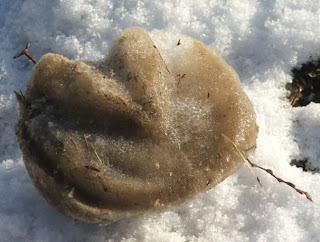 Remember to check feet often when weather conditions favor snowball formation and keep in mind that shod horses have less ability to shed snowballs on their own. Just after this photo was taken, a bucking bug hit. The footing is not great under the snow, so let's hope everyone is careful. Gene and Carol, our intrepid Sunday morning volunteers arrived right on time, so the roads must be in good shape. Water - water, water, water! 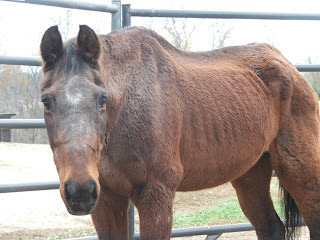 Please remember that horses consuming large amounts of hay will need to drink more water than they do when on pasture. The moisture content of pasture grass is approximately 65-75%, while that of hay is only 8-10%. 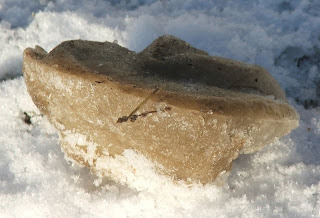 One method is to break through and remove ice from the surface. If the ice is merely a thin "skin," a kitchen strainer works fine on small tanks and buckets. Thicker ice or a larger tank requires a larger removal tool. Find an old feed or water bucket and use a 3/4 inch drill bit to drill holes all over the bucket, making your own big strainer. After breaking the ice up with a hammer, simply dip the ice pieces out of the tank. CAUTION: Keep the bucket over the tank until the water drains out! (You will probably not make that mistake twice unless you enjoy working in wet clothes!) Pile the ice pieces where the horse will not have to walk over them to approach the tank. Check tanks and buckets for ice several times during the day. A second option is to use tank or bucket heaters to keep the water temperature above freezing. There are several types available. Whichever type you choose, remember to keep all electrical cords out of reach of the horses. In addition, please use outlets safely....do not prop open waterproof covers on outdoor outlets, allowing water into the circuit. If your horses' normal water source is a natural source, such as a pond or stream, consider using a tank which is more easily maintained in frigid temperatures. Tank or bucket location is another important thing to consider. Winter means less algae growth, but water tanks still must be cleaned regularly. Less algae growth means little when Toothless Wonders drop wads of hay into the water and the heater brews a strong hay tea. When relocating a tank for the winter, be sure to consider drainage in the new site. 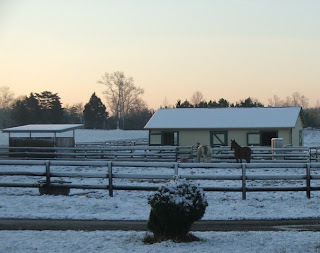 If you dump a tank for cleaning and the water freezes before it drains away or soaks into frozen ground, the horses may be hesitant to walk up to the tank. Hay - Roughage is an essential ingredient in any horse's diet, playing a very important role in maintaining gastrointestinal health. During the winter, hay must be provided to replace pasture grass that has gone dormant. But, winter hay is more than just a replacement for grass. Metabolizing hay produces more body heat in the horse than does the metabolism of grains and other concentrates. When the outdoor temperatures drop lower, more hay will be consumed in most cases. Dentally challenged seniors need special consideration when pasture is unavailable. 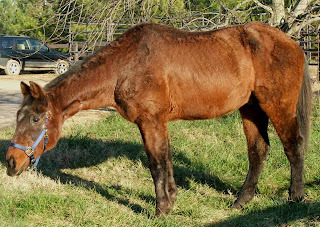 Some marginally toothed horses can chew tender grass shoots but are unable to eat chewy, stemmy hay. In such cases, a commercial chopped forage may work. Wetting the forage may further aid in swallowing, but it also may create problems of its own. Wet forage will freeze into a solid block in cold temperatures, so serving sizes must be no larger than the horse can eat at one "sitting." 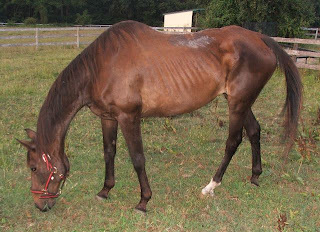 A change in hay may make a difference in how well the horse can eat. A very leafy second or third cutting hay can sometimes be chewed when a stemmy first cutting will be wadded and spit out. A final word on hay is QUALITY. Don't skimp on quality when it comes to this very important ingredient in gut health, nutrition and overall well-being. It was once thought that most winter colic episodes were caused by insufficient water intake. Researchers recently added poor quality roughage to the list of major culprits. When you feed poor quality hay to a horse that cannot chew well in the best of circumstances, and that may have a less than efficient digestive tract, you are tempting fate. Please don't take that risk. Feed - Some younger horses are able to maintain good health and weight on forages (grass and hay) alone. That is not the case, however, for most senior horses, especially those with dental trouble. Most elders are fed a senior feed throughout the year. Most will also need larger amounts of feed in winter since maintaining normal body temperature requires more calories than are needed in warm weather. Some will need a larger increase, in proportion to summer rations, than others. Monitor the horse's weight closely and make adjustments accordingly. Because winter coats often hide subtle changes in body condition, feel for changes over the ribs, hips, withers and shoulders rather than depending on general appearance. When feed intake must be increased significantly for the winter, consider adding another meal to the daily routine rather than trying to feed enormous amounts less often. If the horse is not already eating his senior ration as a mash, consider soaking. Soaking is yet another way to add to overall water intake. 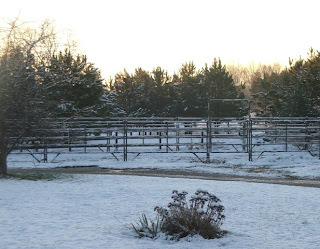 Footing - Icy ground can be a winter nightmare for both you and your horse. First and foremost, be extremely careful and keep yourself safe. If you take a bad spill, not only might you be seriously injured, but you will also not be able to care for the horses, and everybody will suffer. No matter how careful you are, you will likely end up with ice in the area of a water tank. One way to combat this problem is to move the tank to a well drained area. If you are in a climate where the daytime temperatures routinely climb above the freezing point, empty and clean tanks early in the day. Doing so will allow water to drain away or dry somewhat before the temperature drops again that night. If there is no way to avoid ice accumulation in certain areas, sprinkle the area with sand, fine gravel, old bedding or anything else that will help provide traction. One thing to avoid is cat litter. Clay cat litter will absorb a certain amount of moisture, then, especially in high traffic areas, begins to break down into a slimy clay layer that makes things worse rather than better. If you must lead a horse over icy ground, give him his head, plenty of loose lead, and let him choose his own path. Remember that elders are less agile than they once were and may need a little more time to get where you are asking them to go. Finally, whether walking on snow, ice or mud, maintaining balance on slippery ground is hard work. This is especially true in horses that have pre-existing unsoundnesses such as arthritis. They will want to rest more often and you may need to speak with your vet about adjustments in pain management until the footing improves. 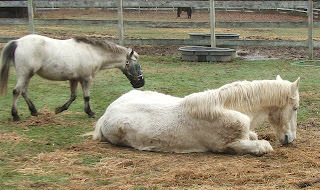 Blanketing - As with younger horses, elders vary greatly in the need for a blanket. Don't be tempted to use a blanket based solely on "old age." 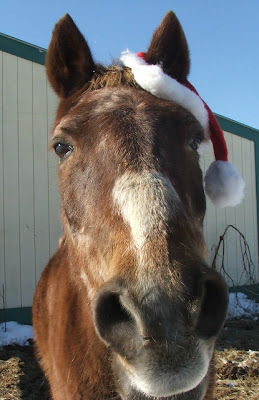 Many equine elders grow very generous winter coats. Keeping them clean and fluffy will ensure the coats maintain maximum insulating capabilities. Monitor for shivering. A horse can literally lose several pounds during a night of shivering. When blanketing is required, avoid the temptation to put the blanket on and leave it on until spring. Use it only when needed. If the horse is one with a heavy coat, one or two warm days can cause sweating under the blanket, and lead to additional problems. Getting snowed upon - If you step outside one morning and see four inches of snow perched on your horses back, don't panic. The fact that the snow is not melting proves that the horse's coat is an efficient layer of insulation between his body heat and the layer of snow. It is a good idea, though, to brush the snow off before the temperature rises above freezing. Once the snow begins to melt, it will make the horse wet. Wet + cold = NOT a Good Thing. Heat - Heat lamps and space heaters in the barn. DON'T. Keep yourself safe -- Finally in our list of winter tips: Take care of yourself. Use caution on icy ground. Wear appropriate clothing and footwear. Don't risk hypothermia or frostbite, even if you'll "only be out there a minute or two." And......chin up! Spring will be here soon!